The notion that motorsports improve the development of road cars is supported by an endless pile of case studies. While also progressing the course of technology, racing can provide a venue to promote a new image or ideology. Happening appropriately on Earth Day, Volkswagen unveiled a hill climb race vehicle the auto company intends to represent the spirit for their already-committed I.D. electric production car future. First announced last October and previewed with sketches that emerged last month, the Volkswagen I.D. R Pikes Peak competition machine has now debuted in its real-world form as a fully-electric super sports car. The introduction comes just two months ahead of the 2018 Pikes Peak International Hill Climb where the vehicle will be driven by former 24 Hours of Le Mans winner Romain Dumas. Slated to be propelled with 680 horsepower of electrically channeled force, the I.D. R Pikes Peak is not merely focused on completing the challenging the 12.42-mile (nearly 20-kilometer), 156-turn course; Volkswagen wants to leave as the new benchmark for a vehicle of its kind. The all-electric Volkswagen I.D. R Pikes Peak prototype features a closed cockpit body style. The structure of the all-electric hill climb race car consists of a carbon fiber monocoque and a steel safety cage. Measuring 5,200 millimeters (204.72 inches) in total length, the race car adopts a strikingly aerodynamic shape. A modern Volkswagen front end grounds the vehicle in the company's image. Along with executing sophisticated engineering to create an appearance for maximized downforce and minimal drag, Volkwagen has worked on ideally packaging all the components into the I.D. R Pikes Peak hill climb prototype race car. Some of the greatest consideration has gone into the battery pack for the vehicle. High-performance lithium-ion battery technology is being utilized with the prototype hill climb car “On Pikes Peak, we need the batteries to provide the best power density they can. That is different to the electric vehicles that you see every day. 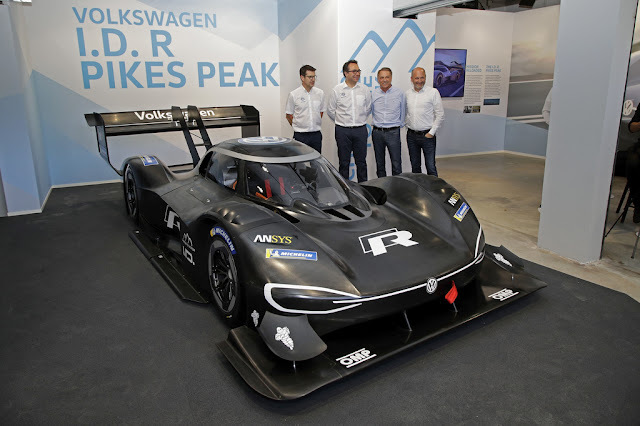 Their energy density must be high enough to generate a larger range.” says Technical Director of Volkswagen Motorsport François-Xavier Demaison. Developed for only a limited race distance, the Volkswagen I.D. R Pikes Peak's battery is minimized. In fact, through energy recovery braking, 20 percent of the I.D. R Pikes Peak's propulsion will be generated through that actual trek. A quick charging system built into the vehicle results in a full charge after only 30 minutes. With the driver, the race car weighs just 1,100 kilograms (roughly 2,425 pounds). Gripping onto pavement with Michelin tires, the Volkswagen I.D. R Pikes Peak vehicle's traction will be managed through a permanent four-wheel drive system with active torque distribution. Set to compete in the Unlimited class at the 2018 Pikes Peak International Hill Climb on June 24th, the Volkswagen I.D. R Pikes Peak vehicle will undergo an extensive testing program. Estimated performance data for the race car lists its potential acceleration time from 0 to 100 kilometers per hour in just 2.25 seconds (0.35 seconds quicker than a Formula 1 machine). The top speed for the I.D. R Pikes Peak is approximated at 240 kilometers per hour. One key advantage Volkswagen touts about the use of an all-electric powertrain is the lessened effect of altitude. While internal combustion engines lose efficiency at higher elevations due to decreased air pressure, the an electric vehicle can maintain full power throughout a climb up the 4,302-meter (2.67-mile) above sea level summit of Pikes Peak. The Volkswagen I.D. 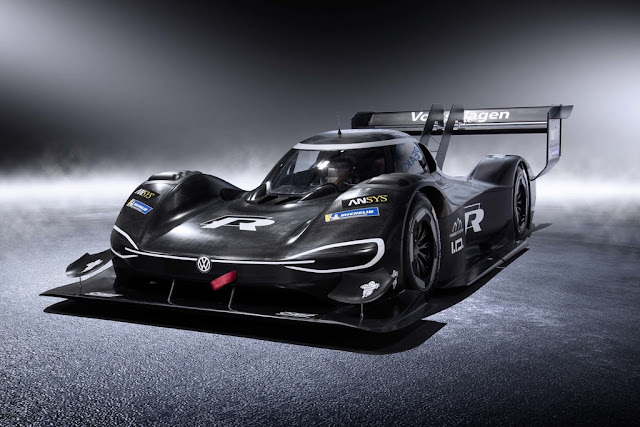 R Pikes Peak race car will also benefit with the skilled hands of Romain Dumas who has pulled off an overall win at the prestigious hill climb on three times. 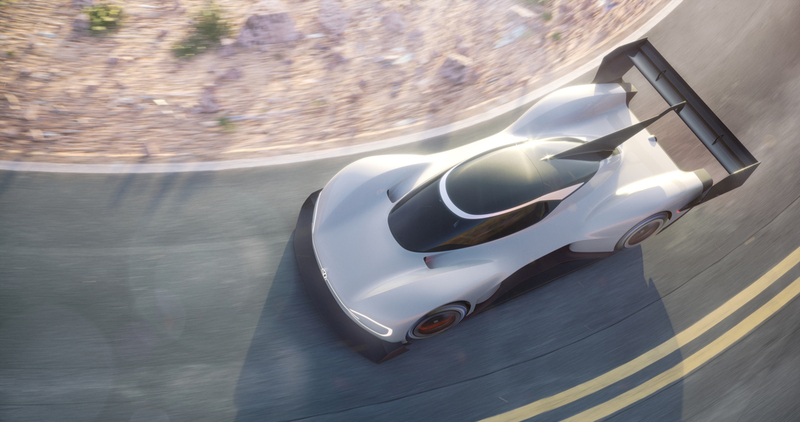 The current record for an electric vehicle scaling the 12.42-mile Pikes Peak hill course is 8 minutes, 57.118 seconds set in 2016 by a eO PP110 prototype driven by Rhys Millen.